HTY79 Series Duct Dew-Point Temperature Sensor. 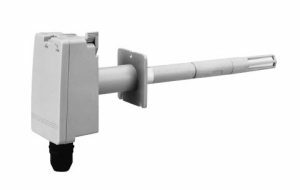 The duct dew-point sensors in the HTY79 series are highly accurate and highly reliable sensors that use a combination of a Pt100 platinum resistance temperature detector (JIS C1604 class A) as the dew-point temperature sensing element and a polymer capacitive humidity sensing element. With their wide measurement range and excellent stability, they can be used in a variety of industrial applications as well as building air conditioning, outdoor air measurement, and other applications.